Morphology: A protozoan parasite with two stages in its life cycle: a motile vegetative state (trophozoite) with 2 nuclei and 4 pairs of flagella which can live in the small intestine and cause disease: and a chlorine-resistant form. Habitat: Lives in the intestines of humans, dogs, cats, beavers and other animals. Found in rivers and streams and it can end up in swimming and wading pools. Giardia is the most commonly identified intestinal parasite in North America. Disease or illness: Symptoms of infection are nausea, stomach cramps, fever and sudden onset of watery explosive diarrhea. Some Giardia infections last months to years. Who is at risk: Anyone who drinks contaminated water, children in daycare centers, hikers who drink water directly from rivers and streams. Avoidance techniques: Don’t drink water from rivers and streams no matter how clean it looks. Boil drinking water when camping. Municipal water supply should be filtered and treated. 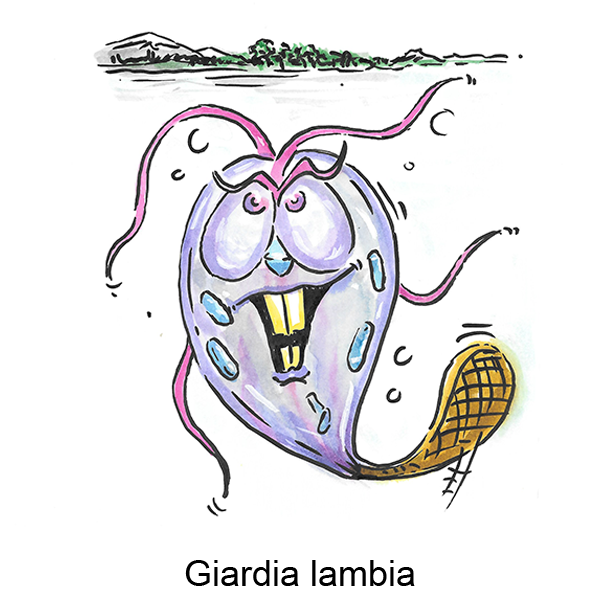 Giardia is inactivated by exposure to UV light. Wash hands after using the toilet or changing diapers or contact with animals. Wash fruits and vegetables before eating.